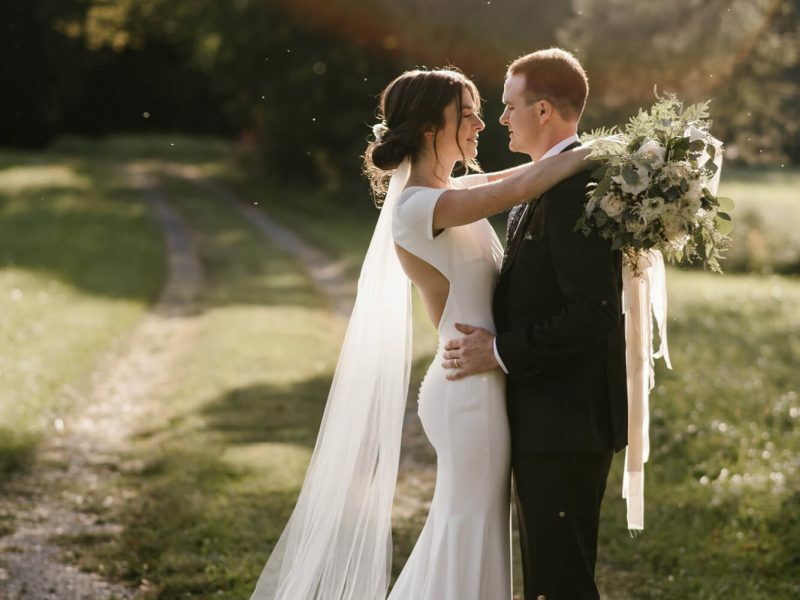 This originally ran as a Local Love in the 2016 issue. 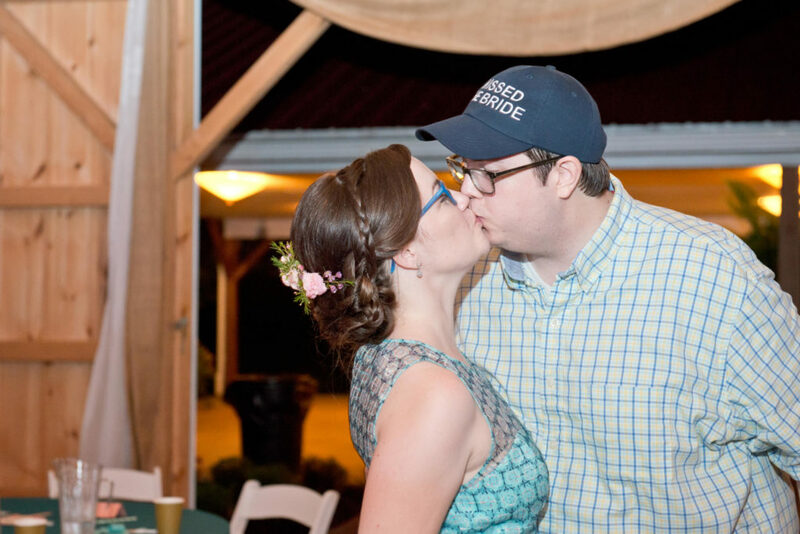 Kristin Nohe and Tim Juchs missed being high school sweethearts by just a few months. 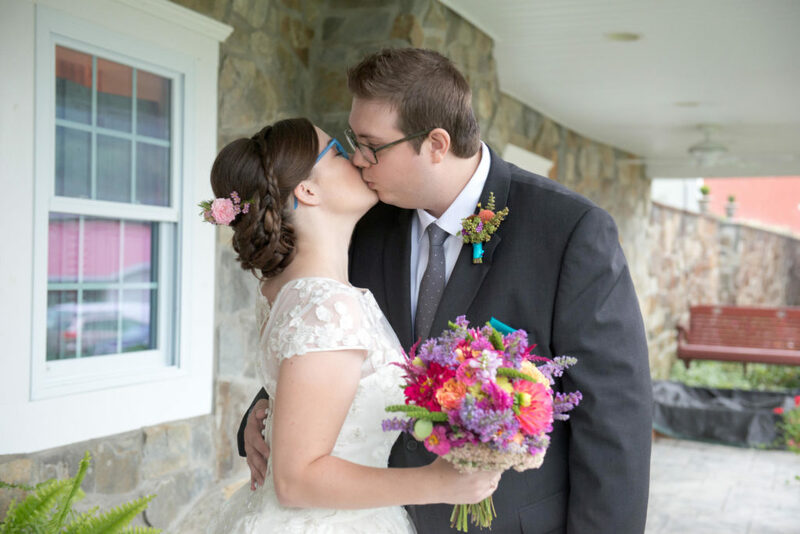 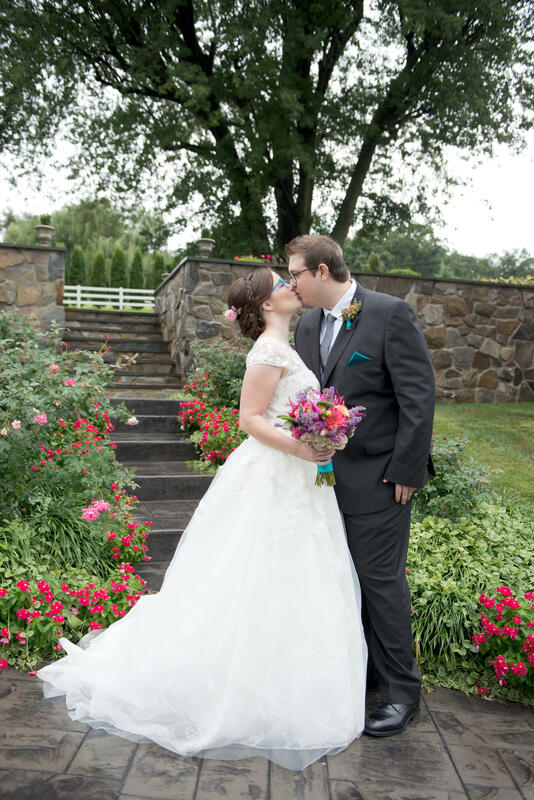 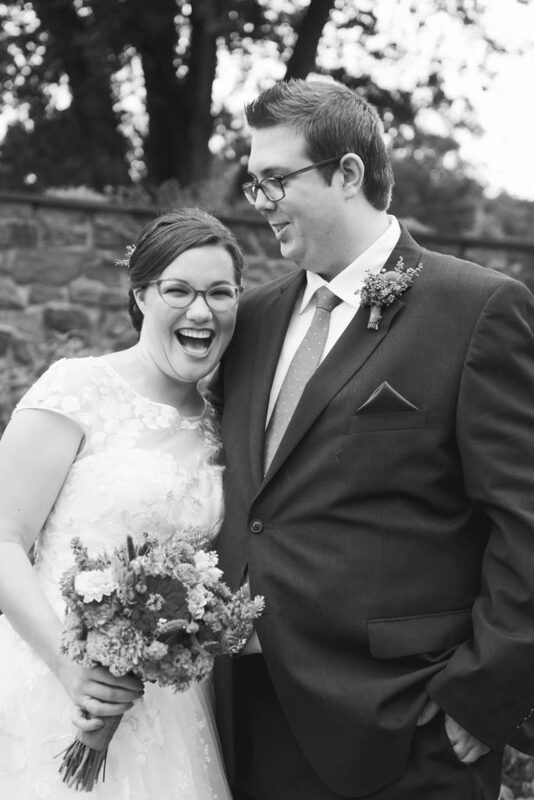 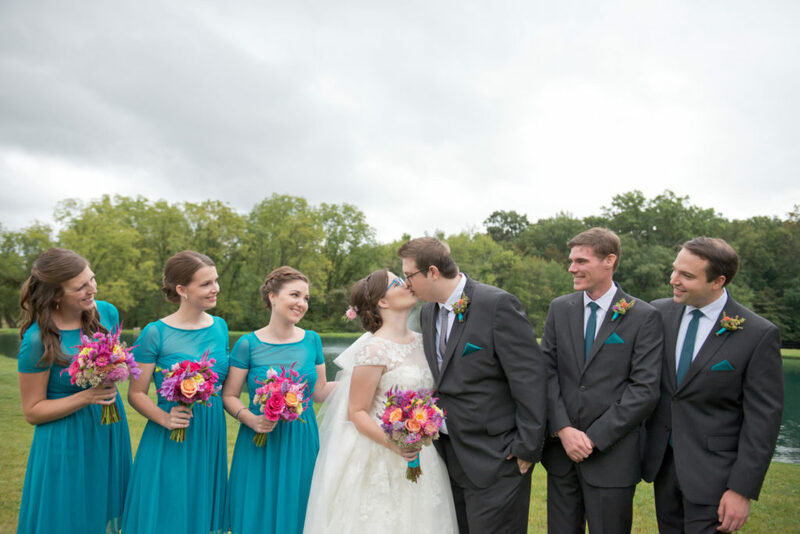 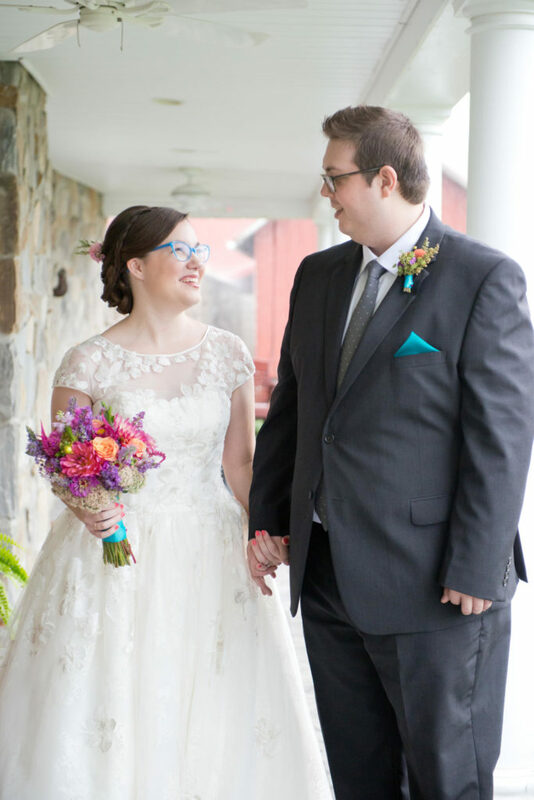 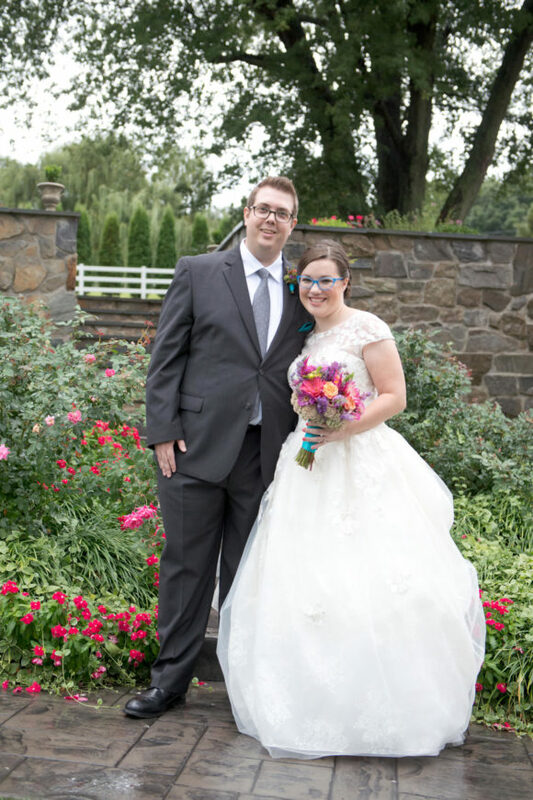 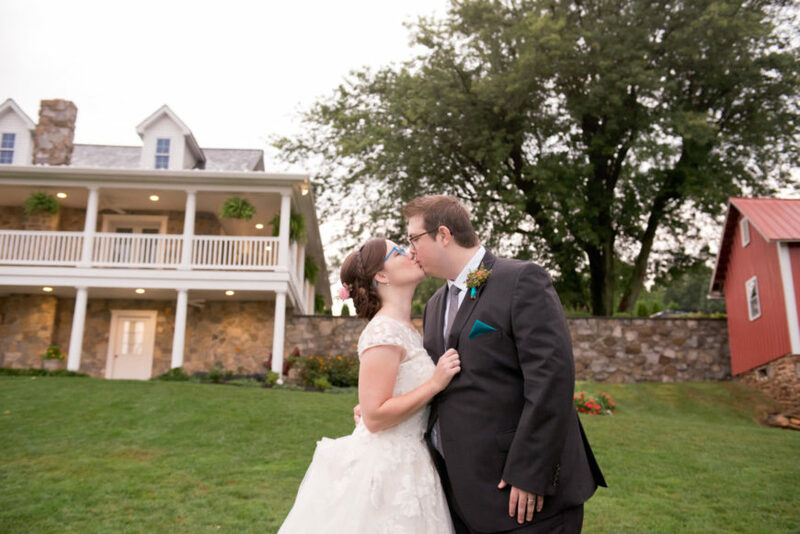 They started dating after their senior year, right before Kristin headed to the Maryland Institute College of Art and Tim to Frostburg. After graduation Kristin scored a job as a designer at the Target headquarters in Minneapolis and Tim went with her. 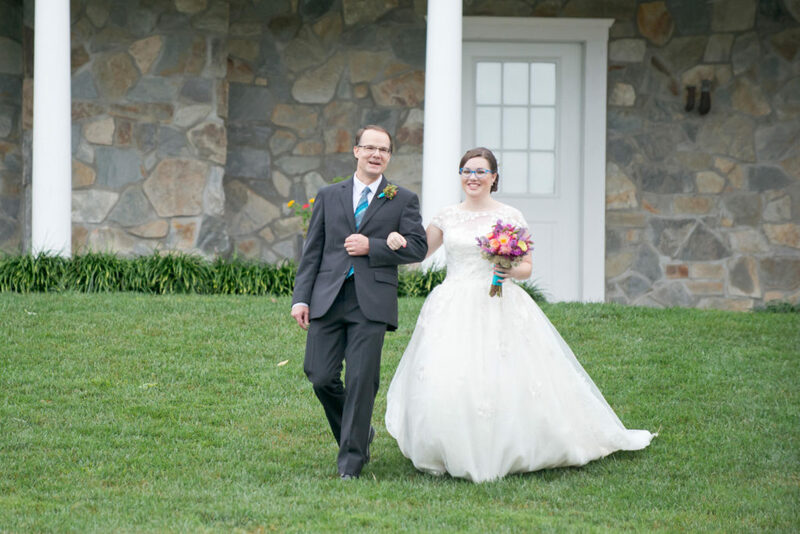 Suddenly, they went from dating long distance to living together in a new city far from home. 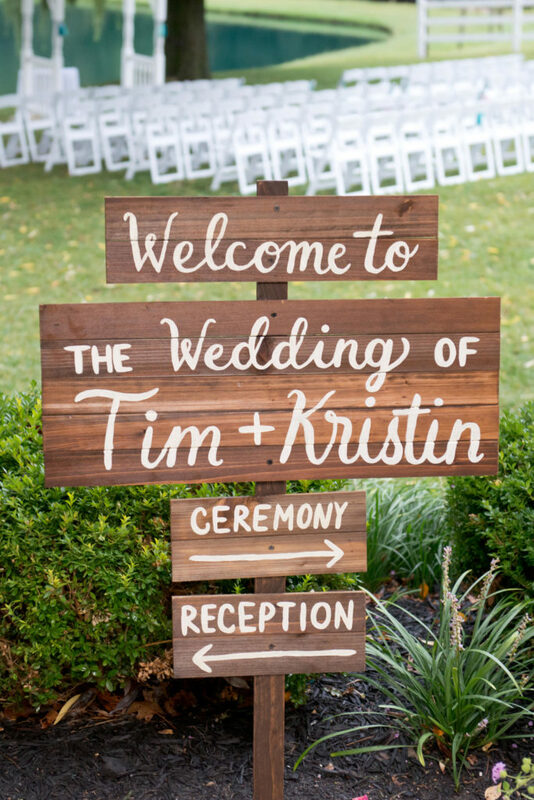 One Friday, Kristin got home from her job and found Tim with a new haircut and wearing nice pants. 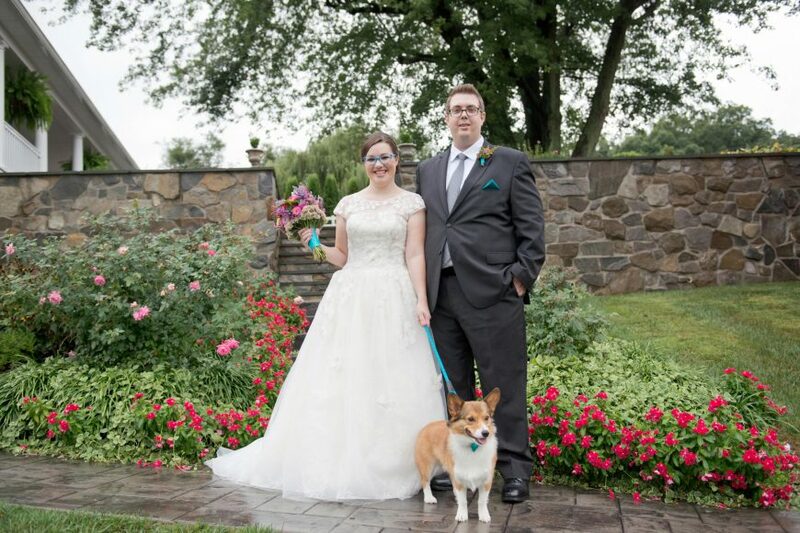 They took their corgi Pollo (they both like Mexican food) for a walk around the lake. 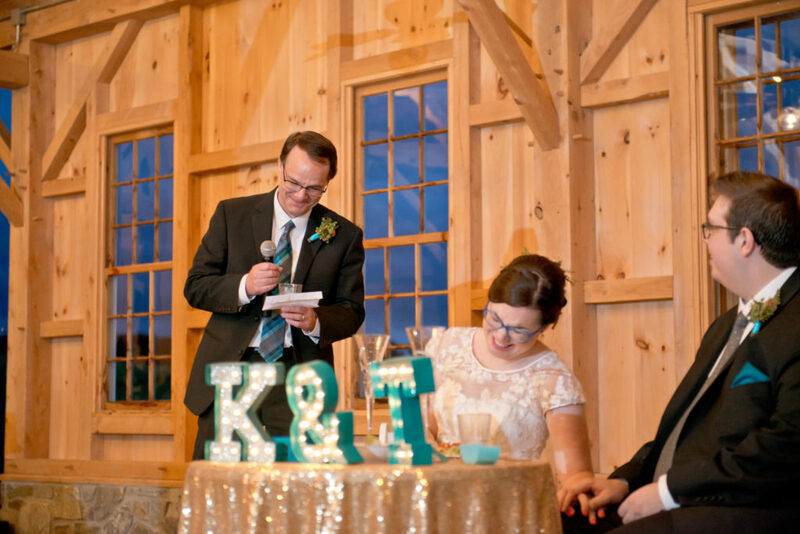 Pretending he needed to do something with the dog, Tim bent down, pivoted toward Kristin, and proposed. 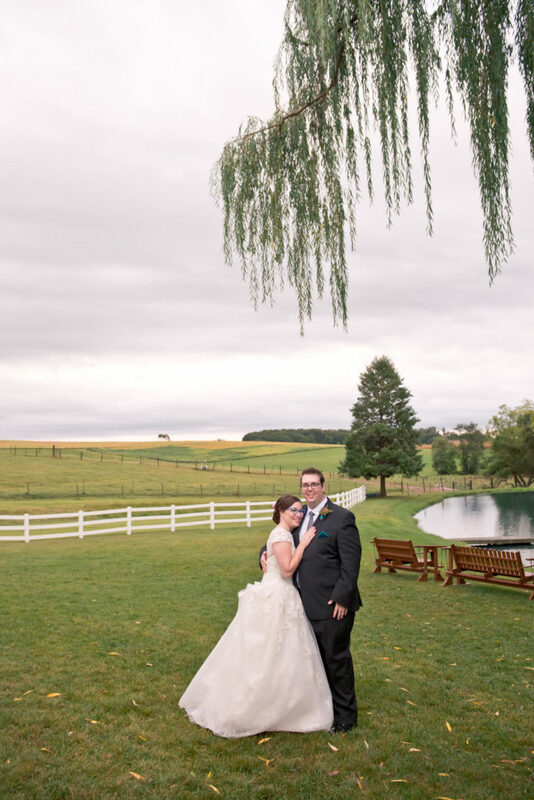 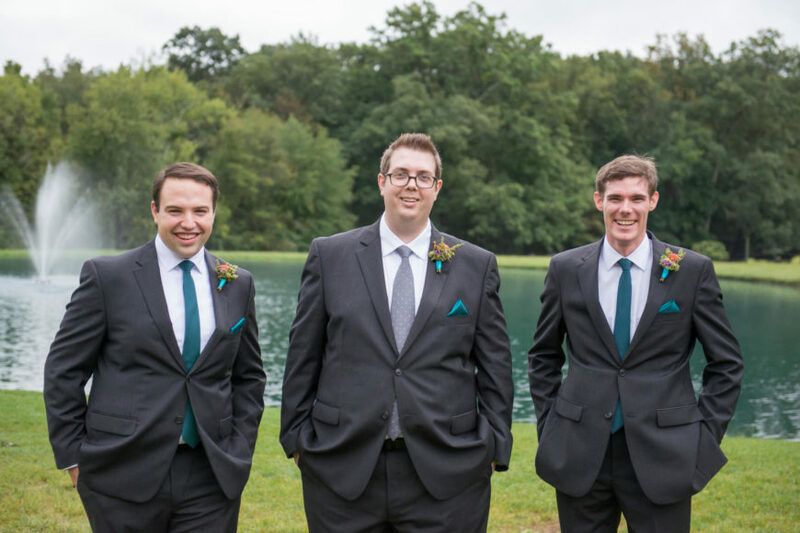 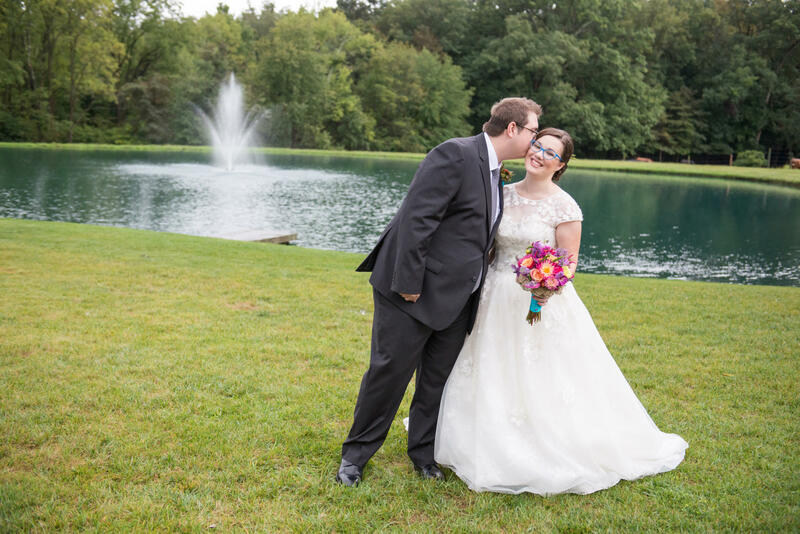 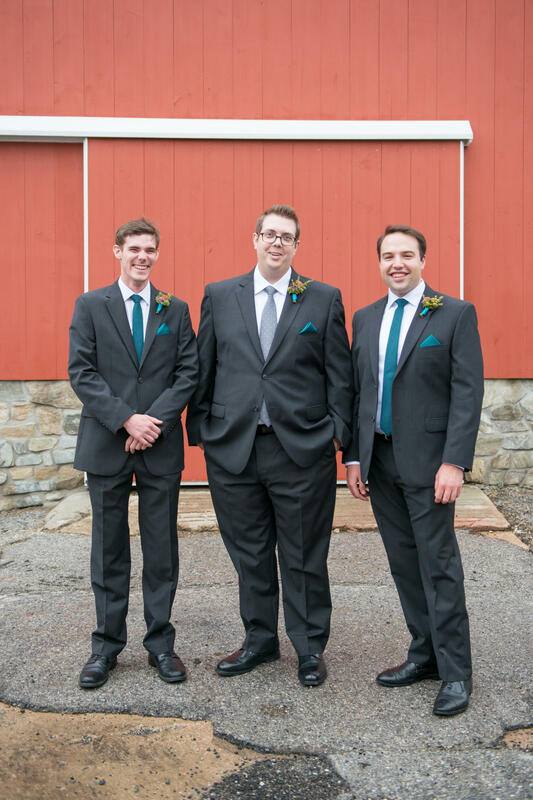 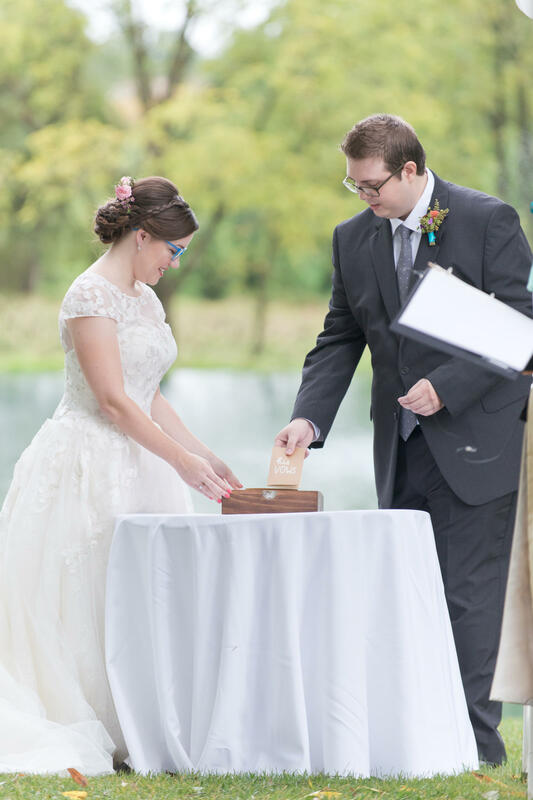 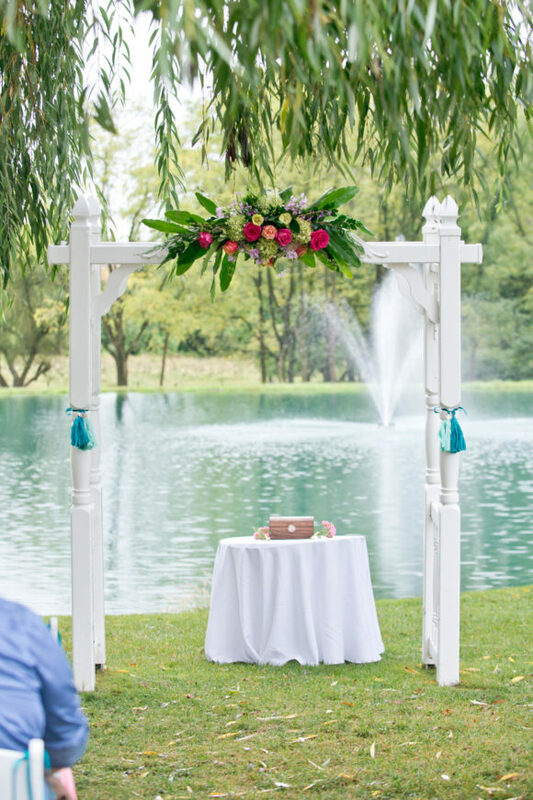 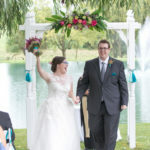 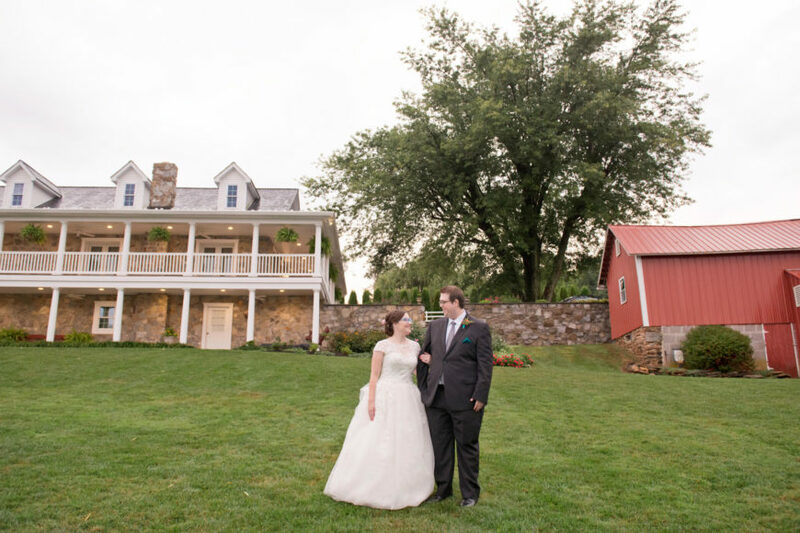 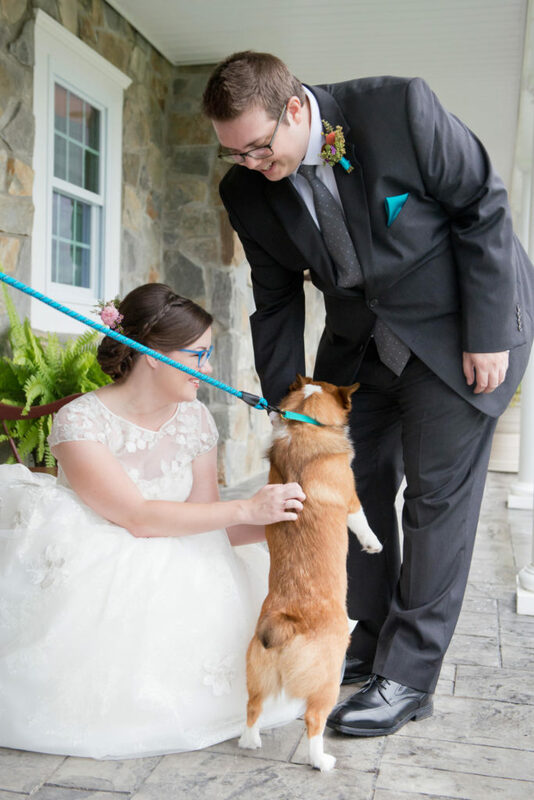 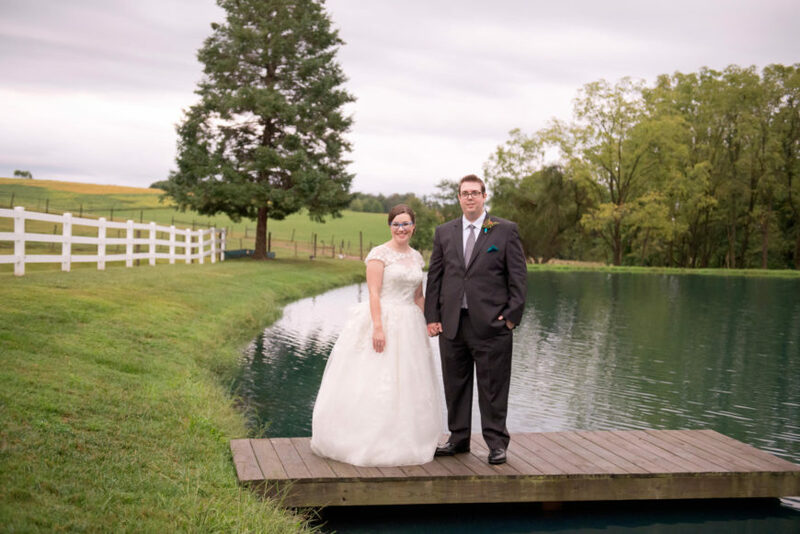 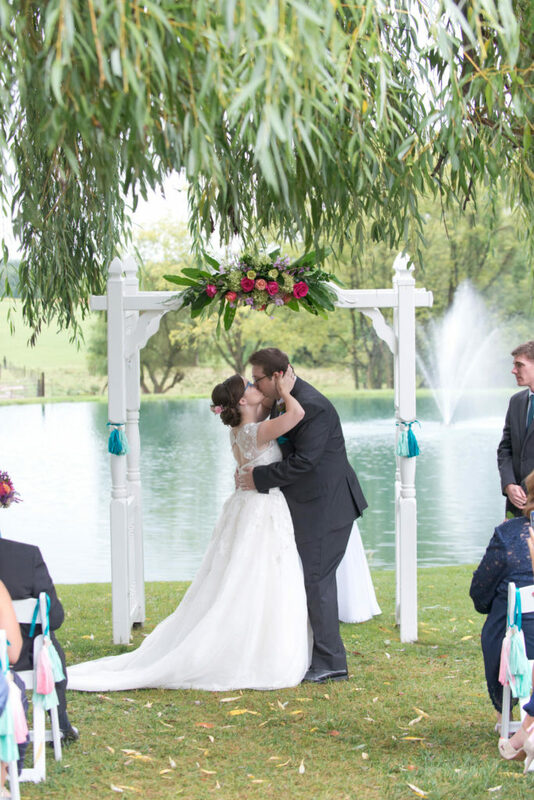 During a wedding-planning trip home, they visited Pond View Farm. 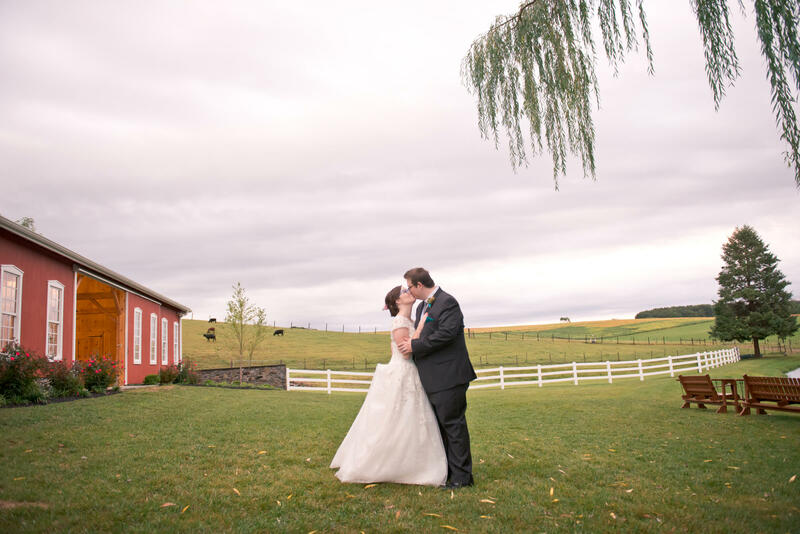 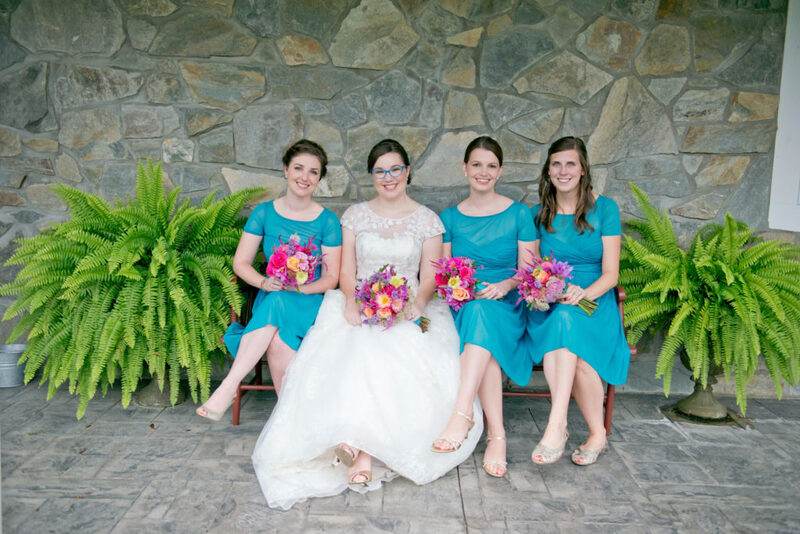 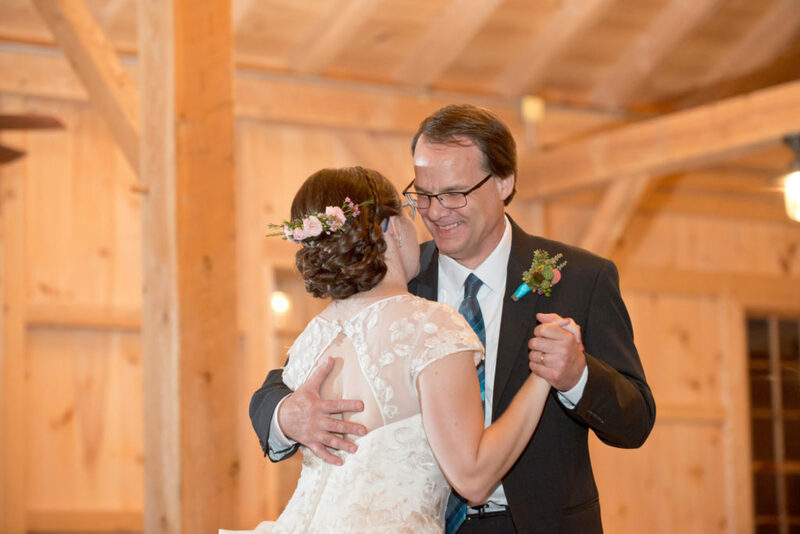 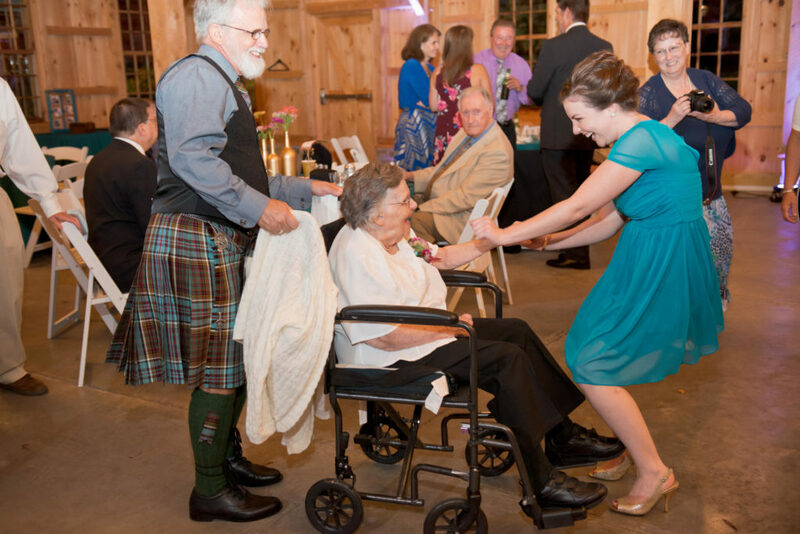 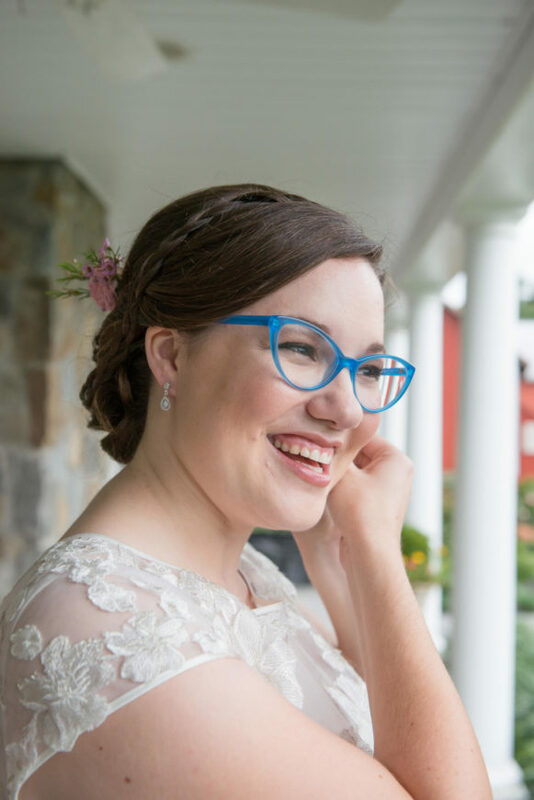 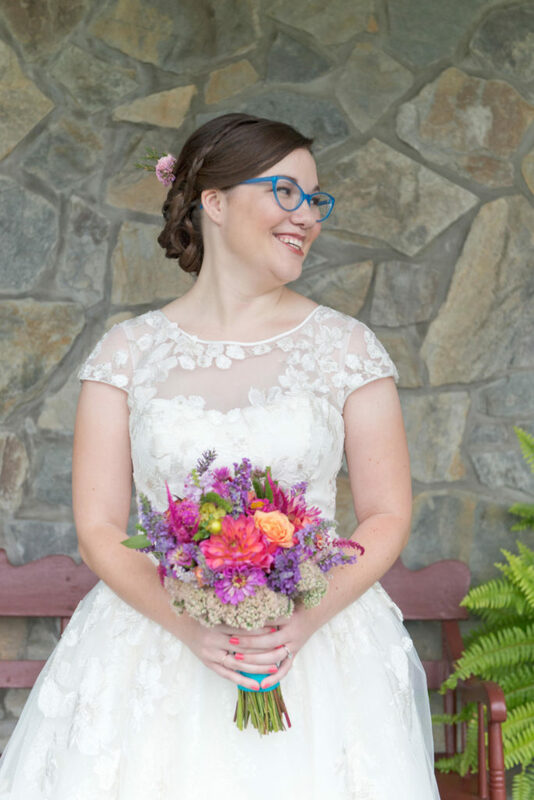 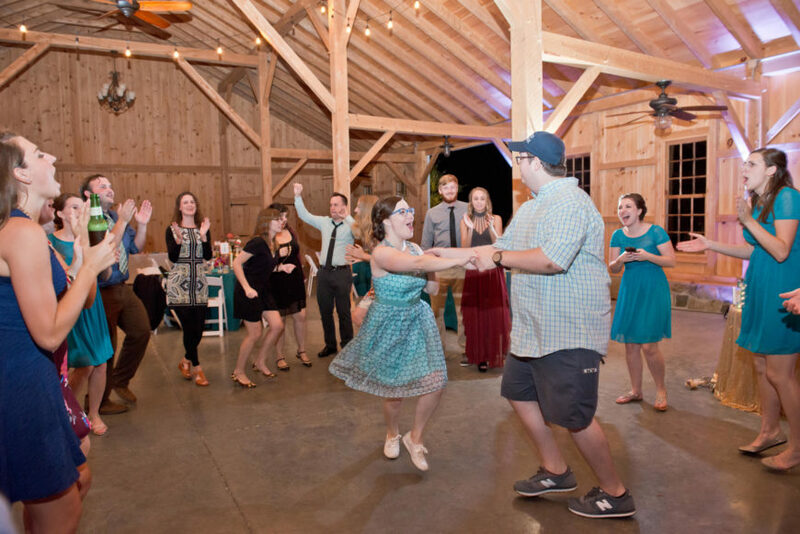 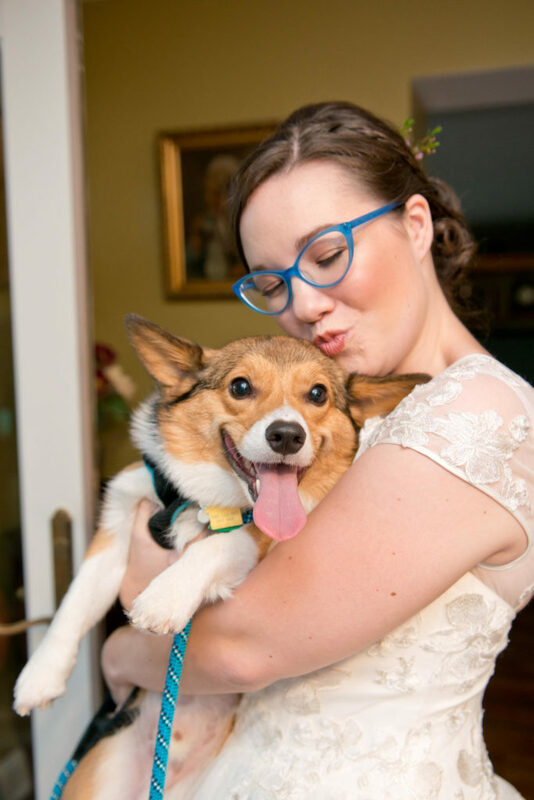 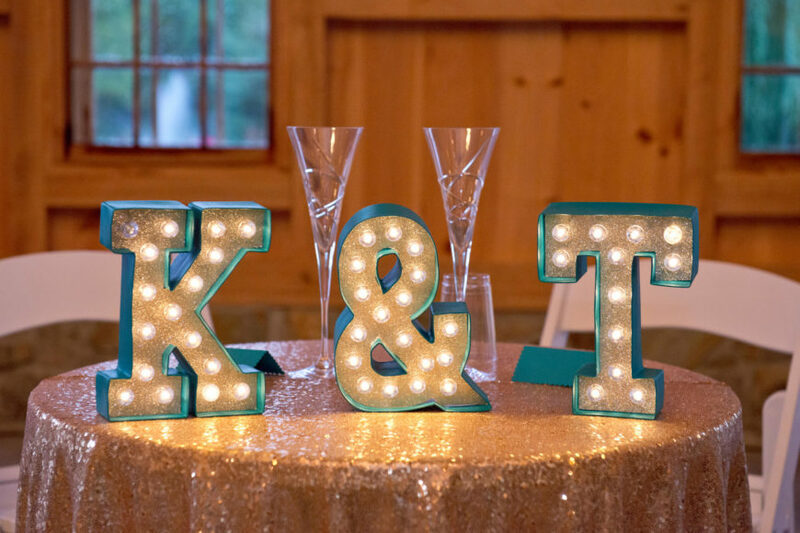 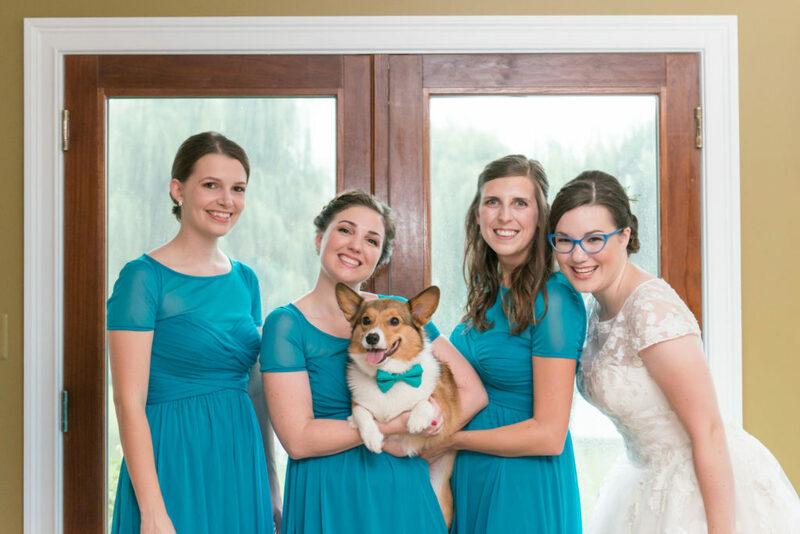 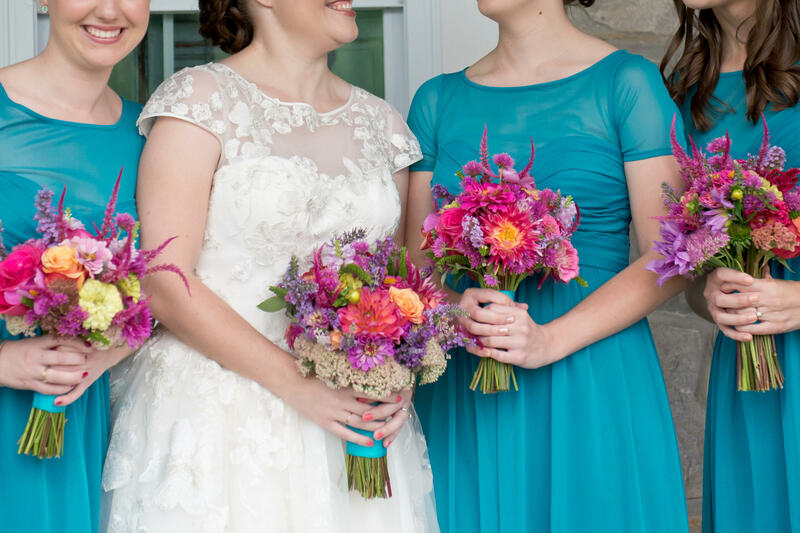 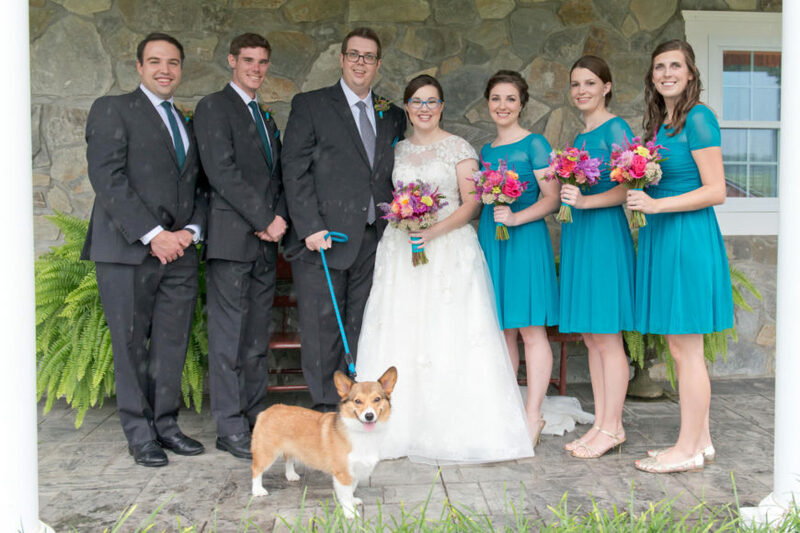 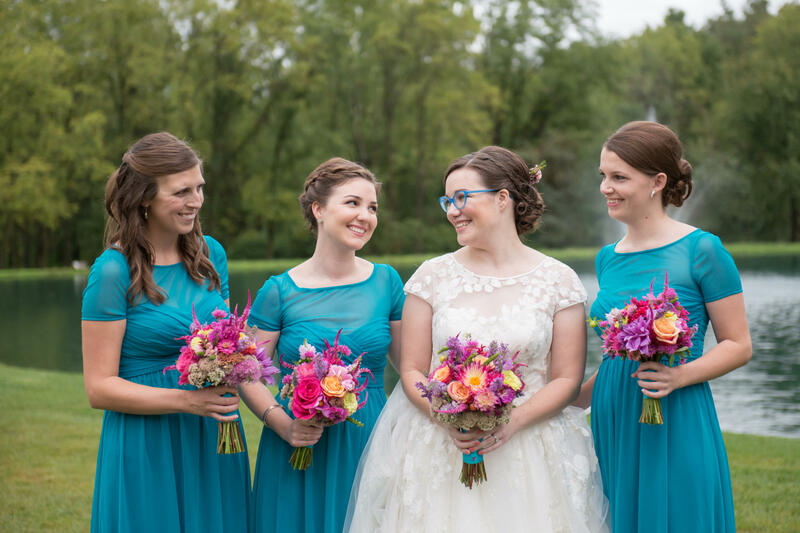 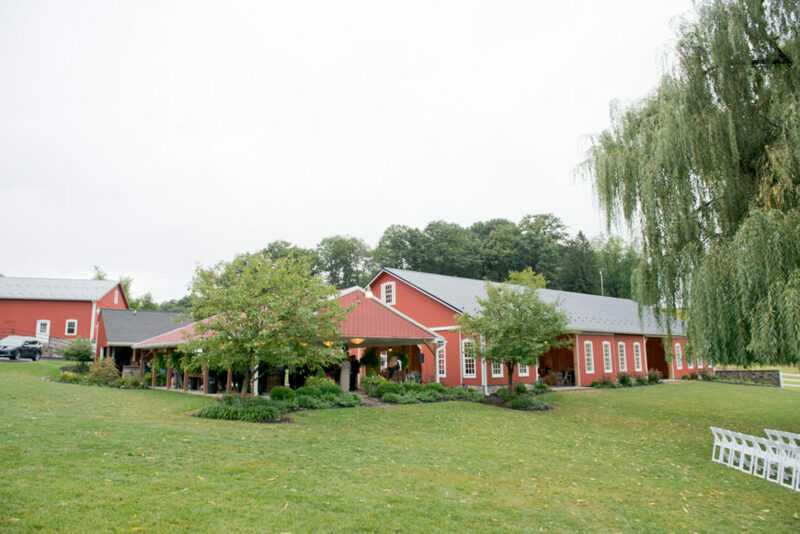 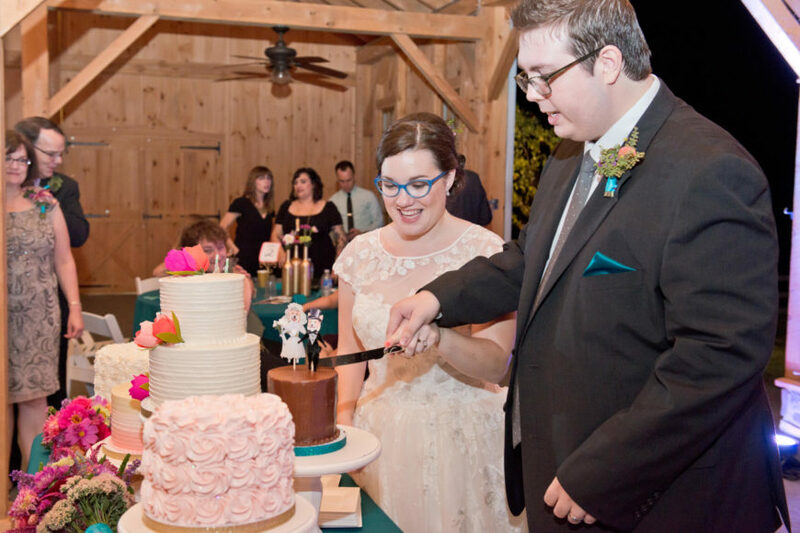 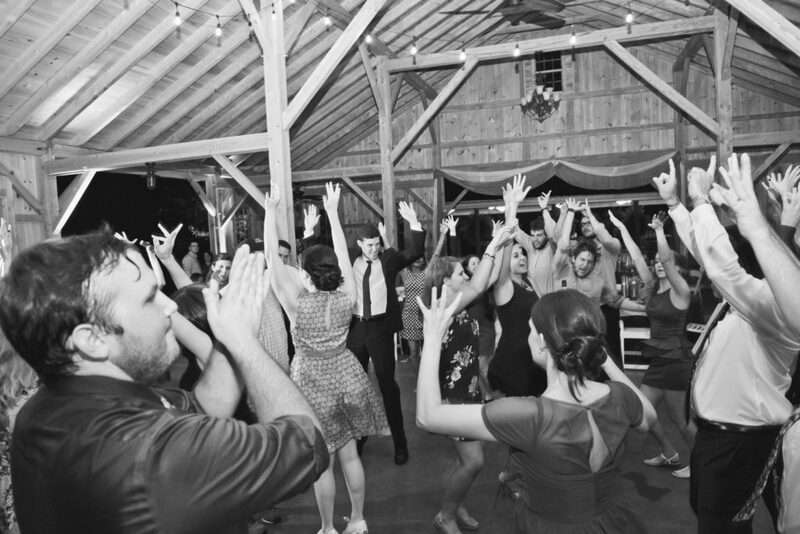 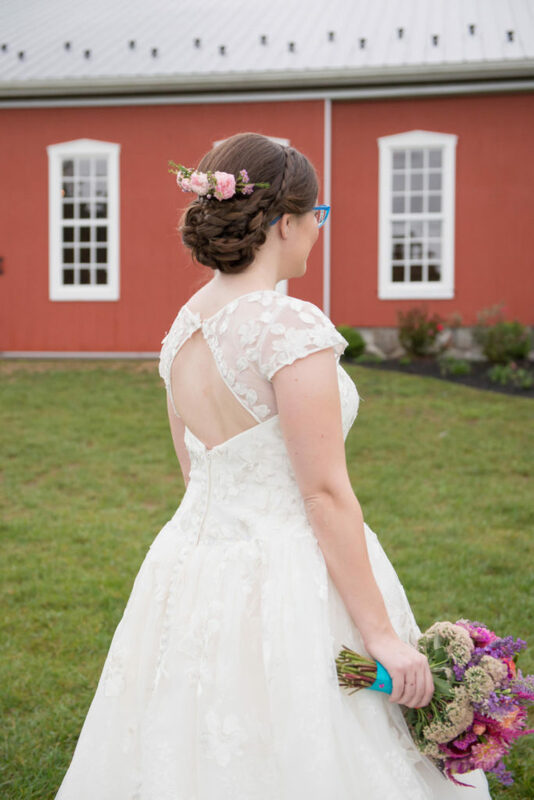 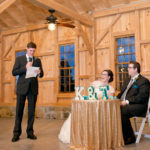 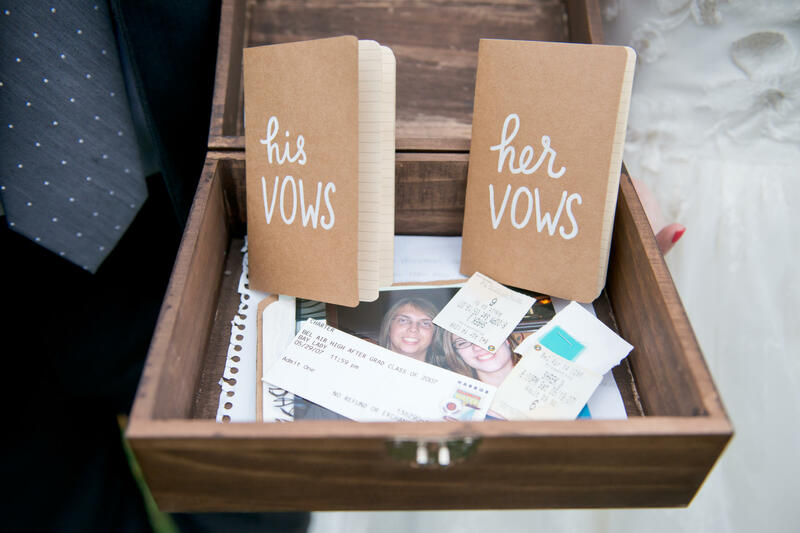 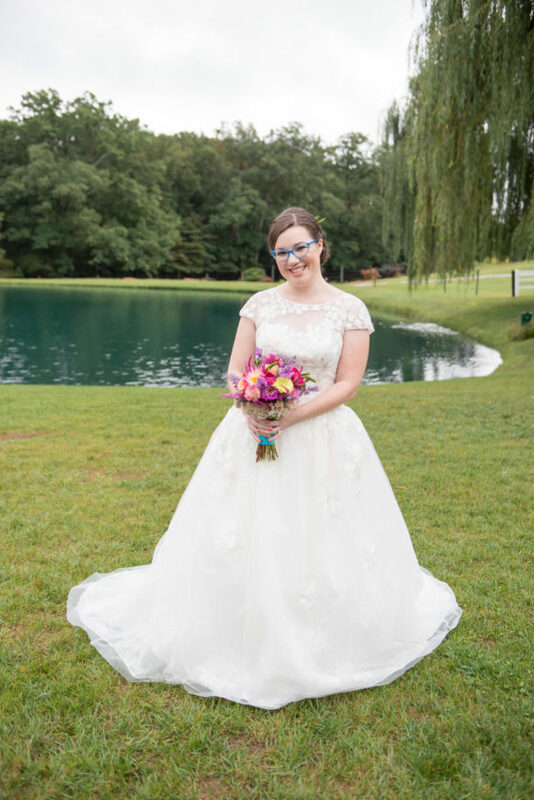 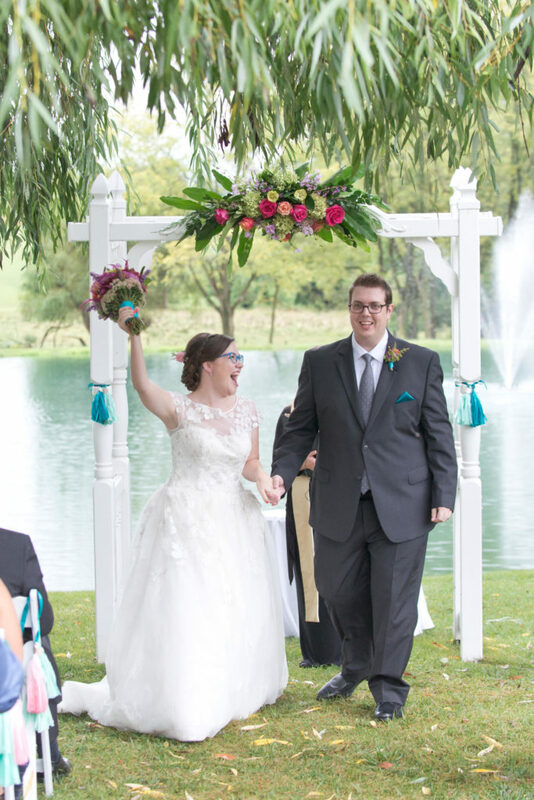 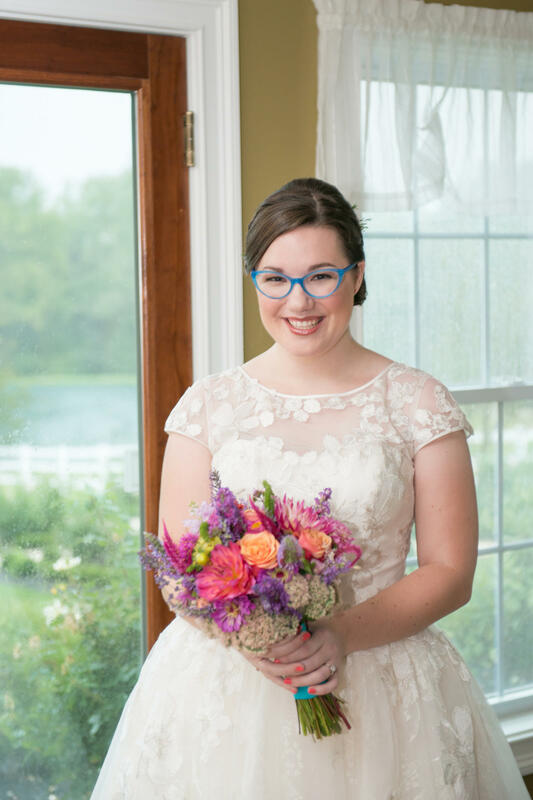 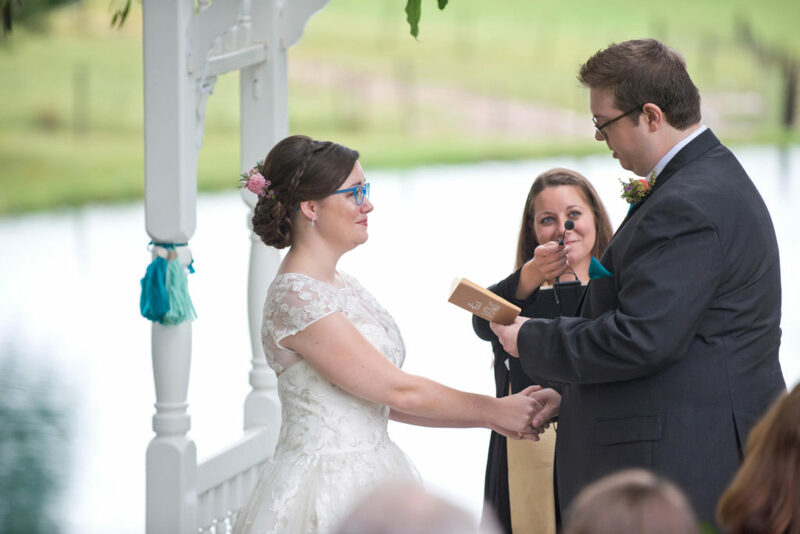 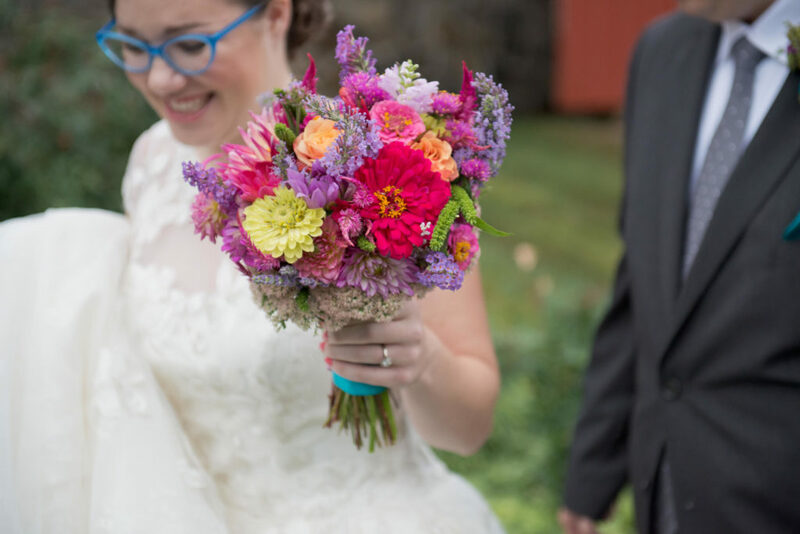 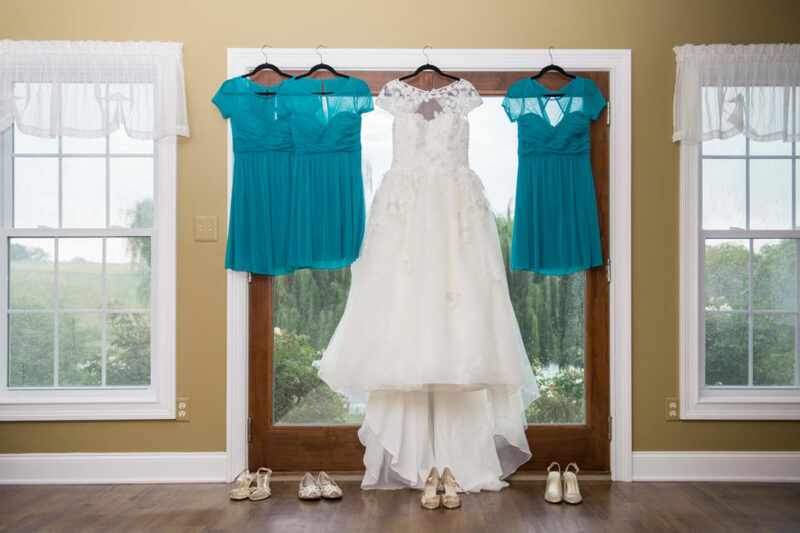 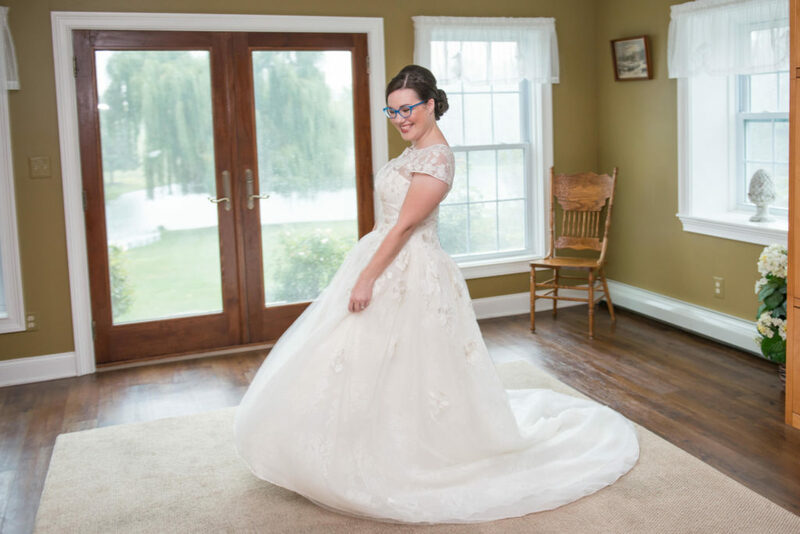 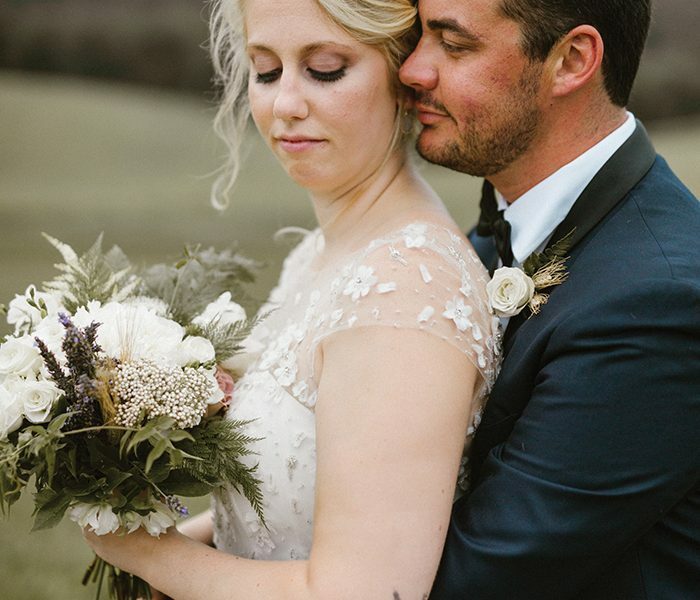 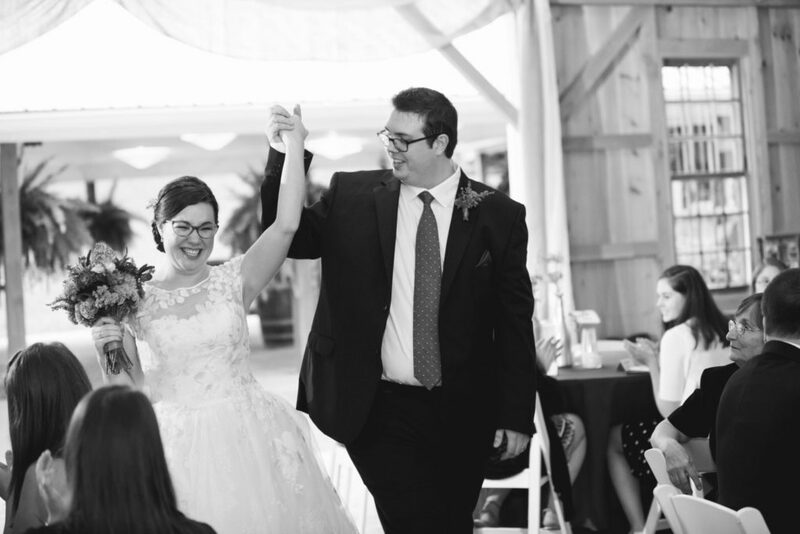 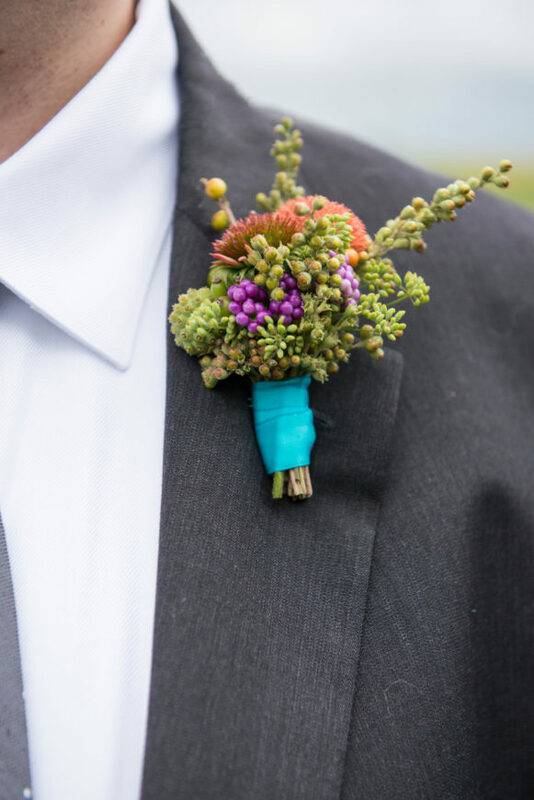 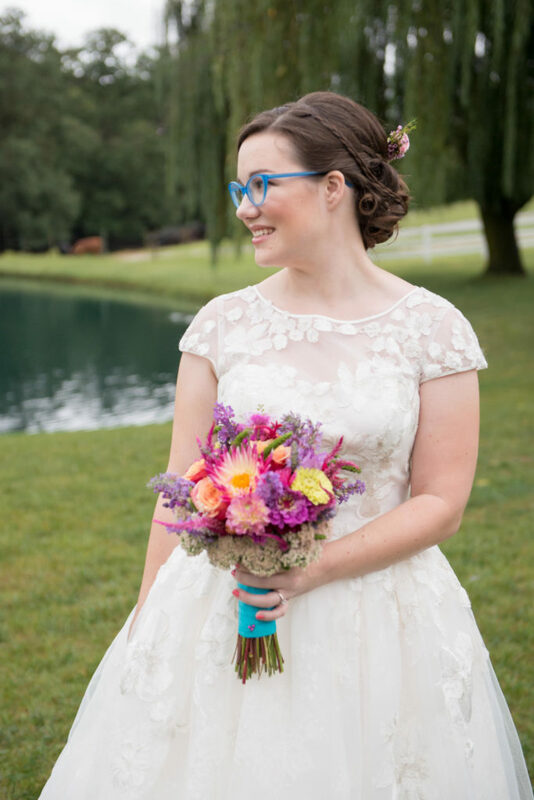 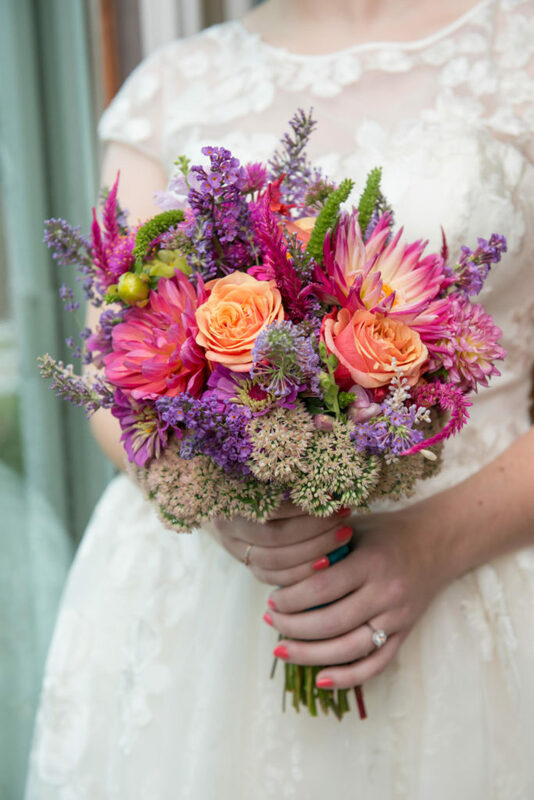 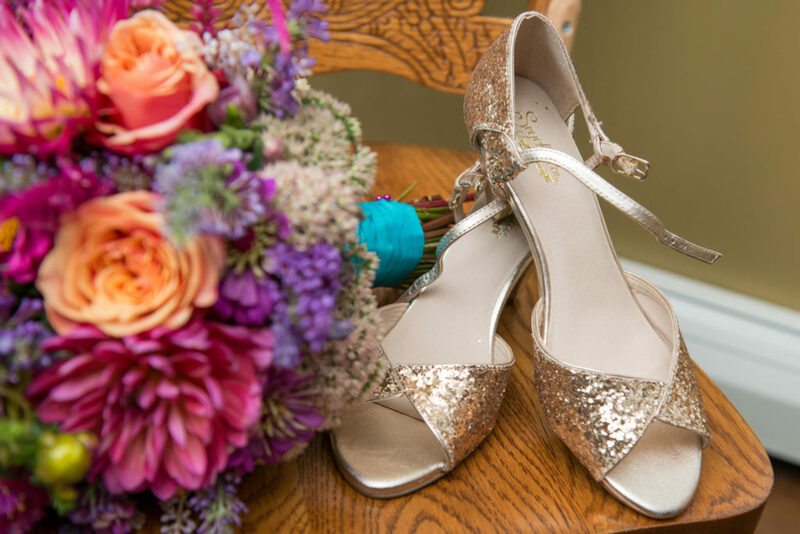 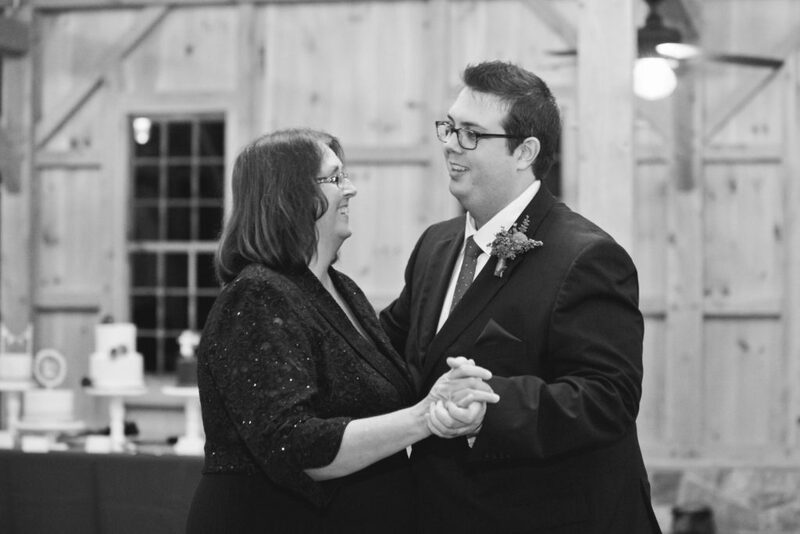 “The only thing rustic about my wedding was that it was in a barn,” says Kristin. 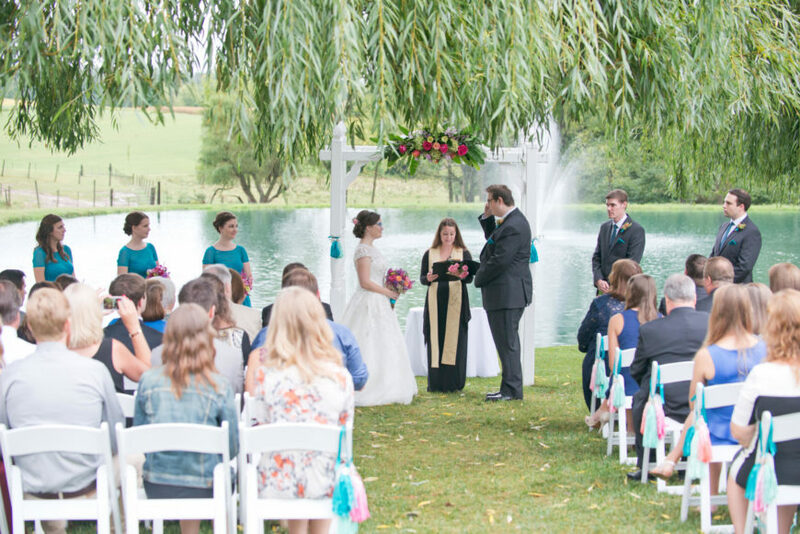 “We loved the venue.” They booked it on the spot. 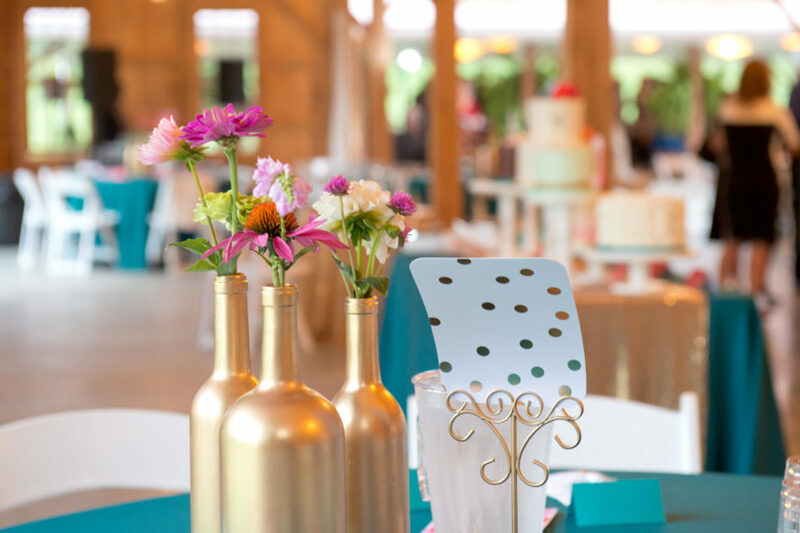 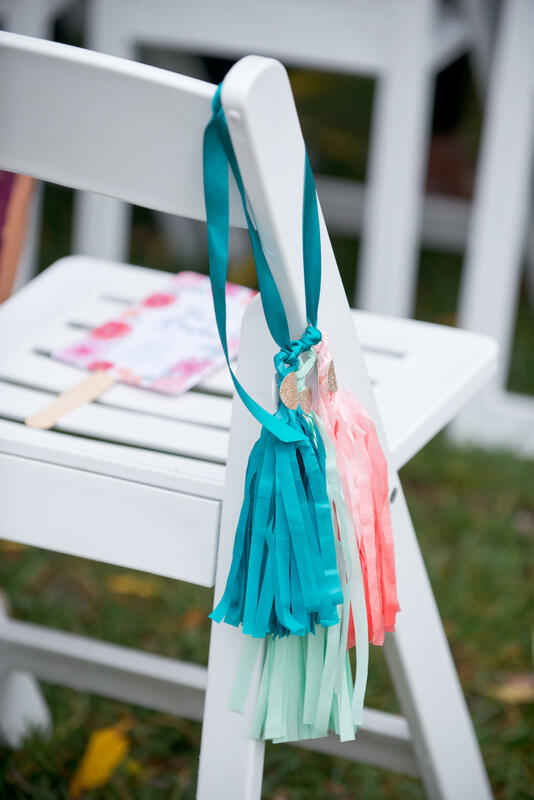 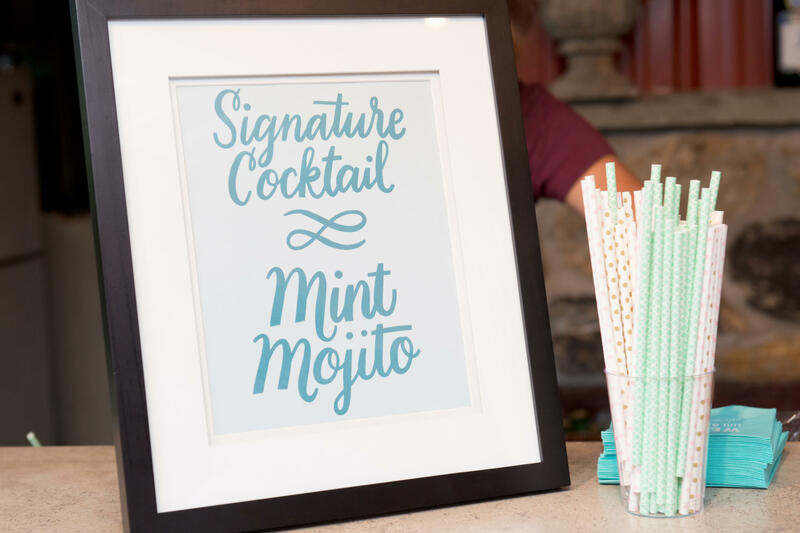 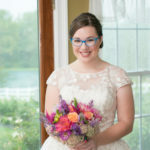 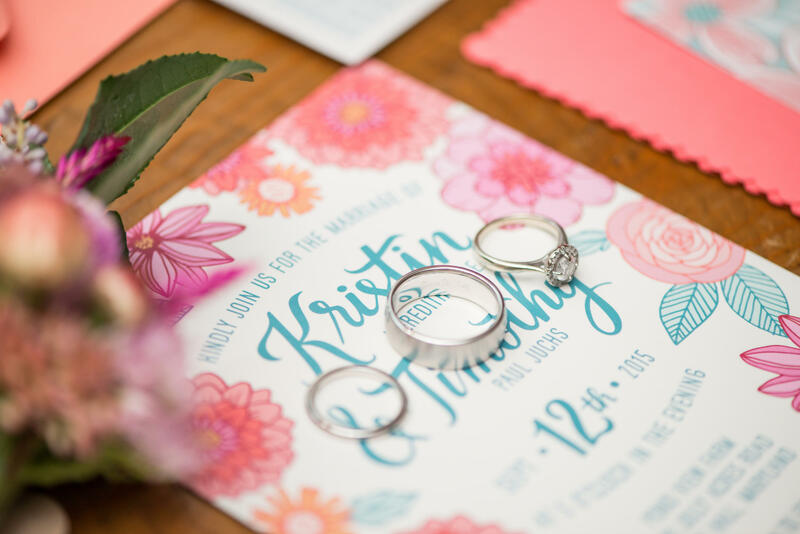 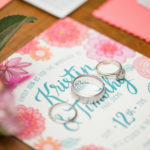 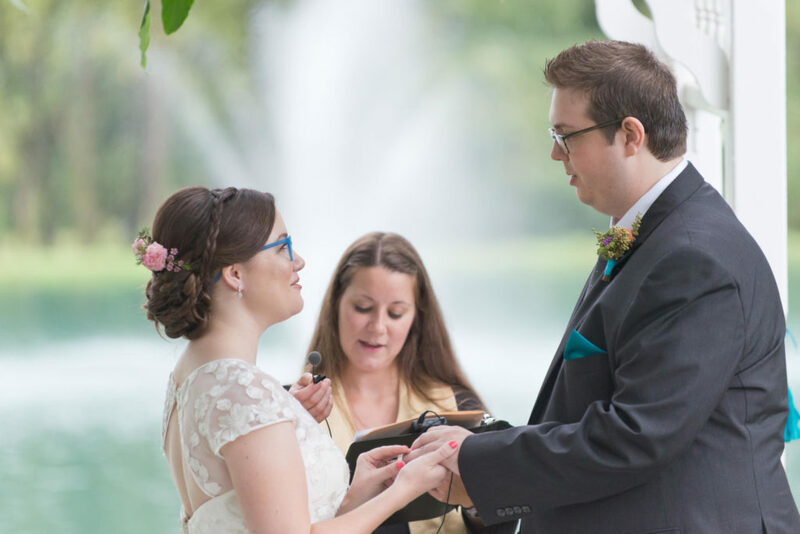 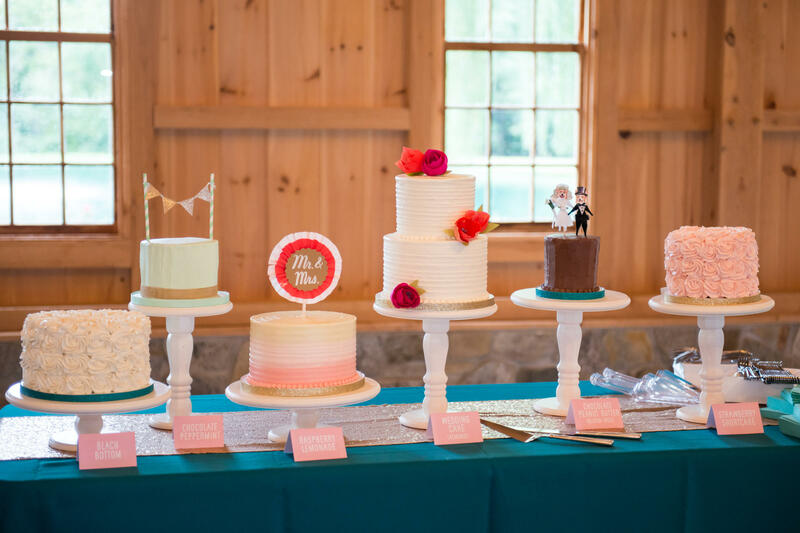 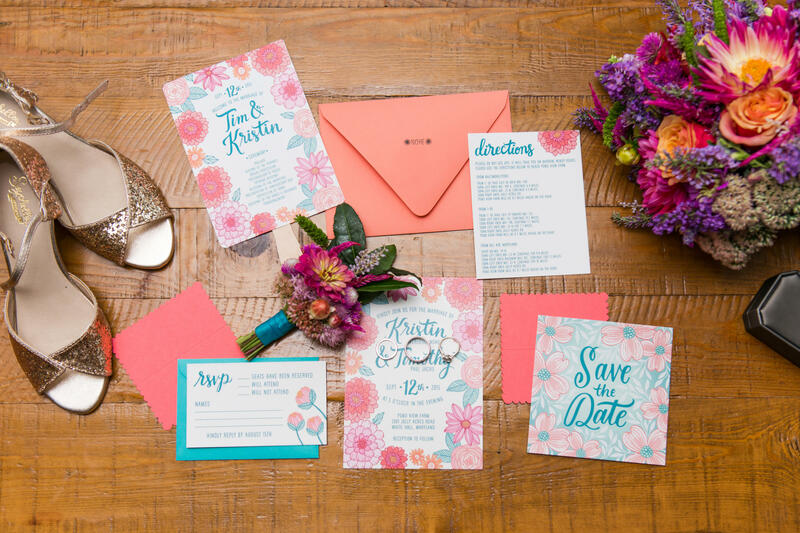 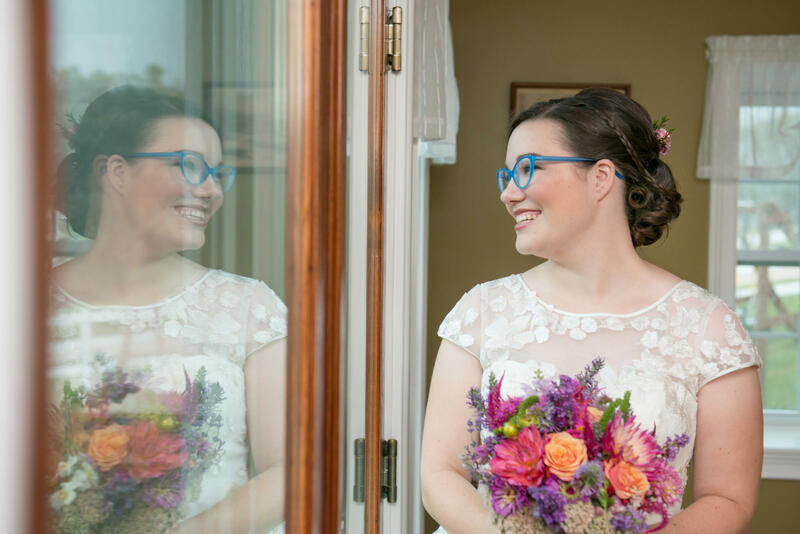 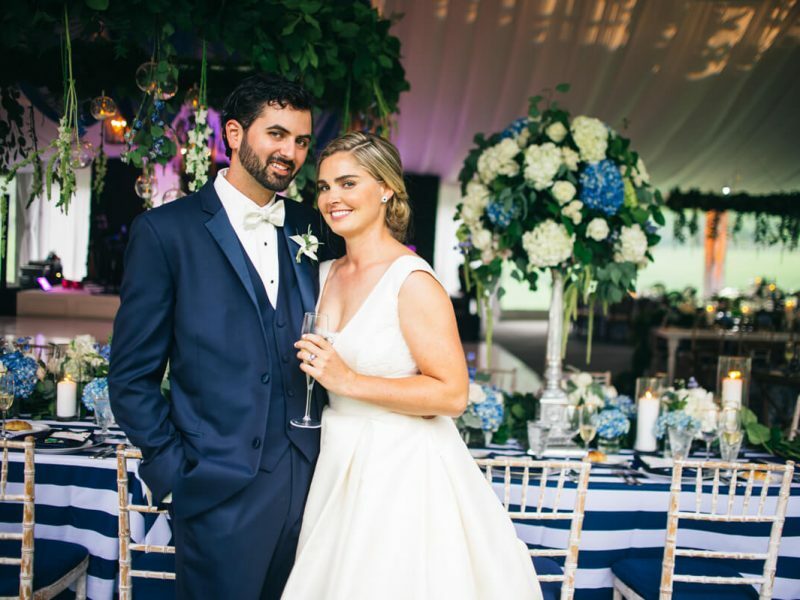 A few months before the wedding they were back living in Bel Air and Kristin turned her creative juices to the event, designing all the paper goods including the invitations, programs, and place cards. As it goes with weddings, the only thing you can’t control is the weather. 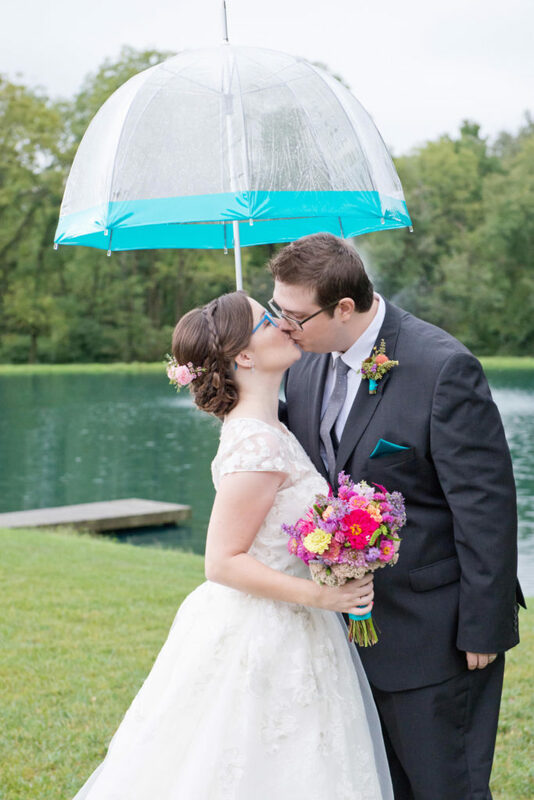 Rain was scheduled all day long. 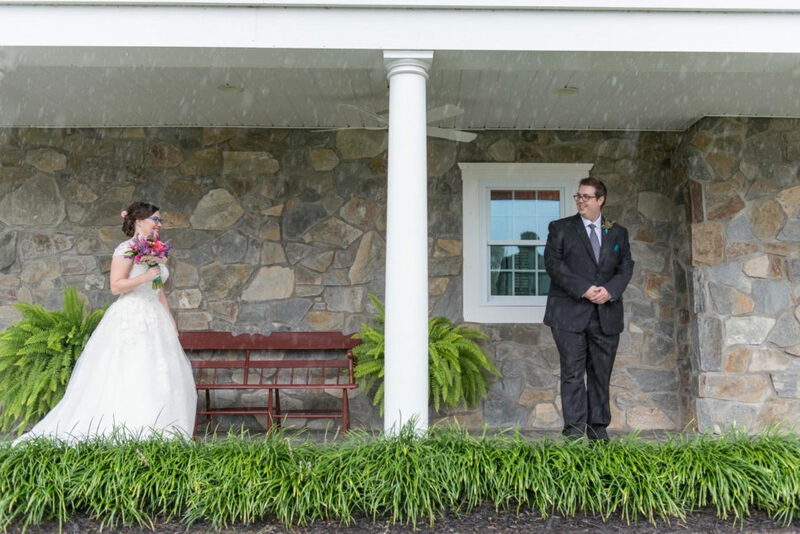 And it did rain all day until exactly 4:45 (15 minutes before the ceremony) when radar showed one hour with no precipitation. 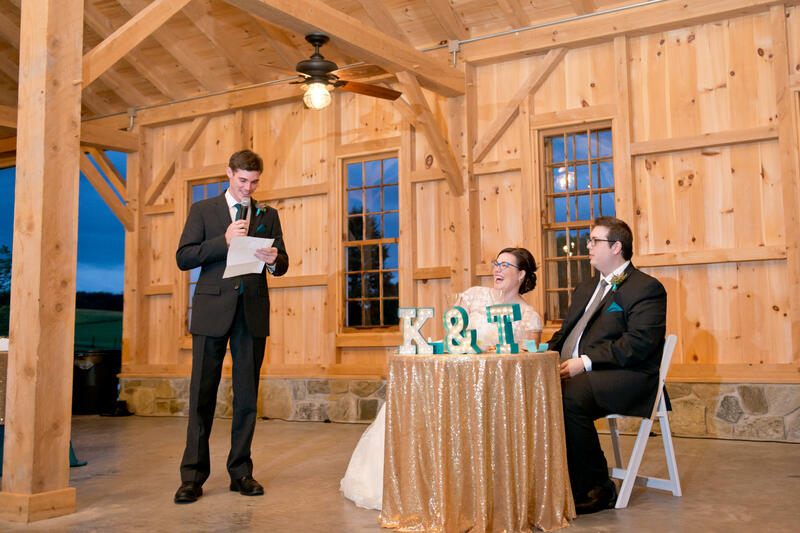 “It was so insanely weird how it all worked out,” says Kristin. Another thing that worked out? 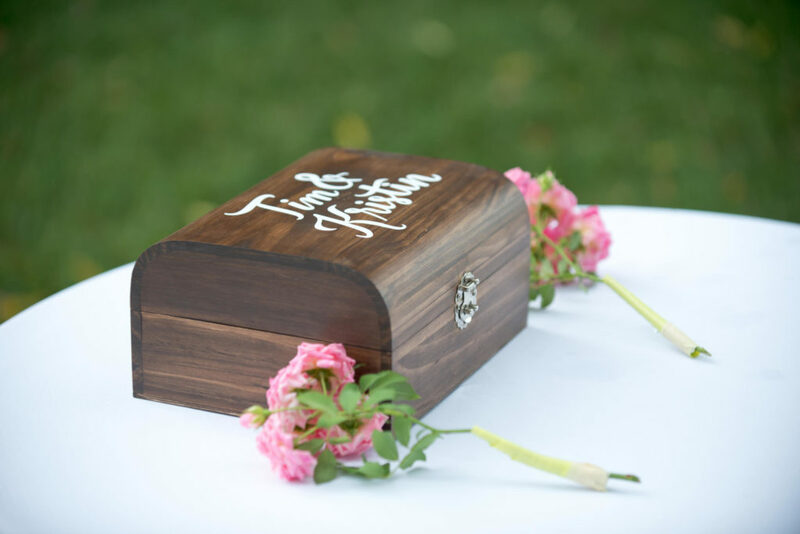 The ceremony box. 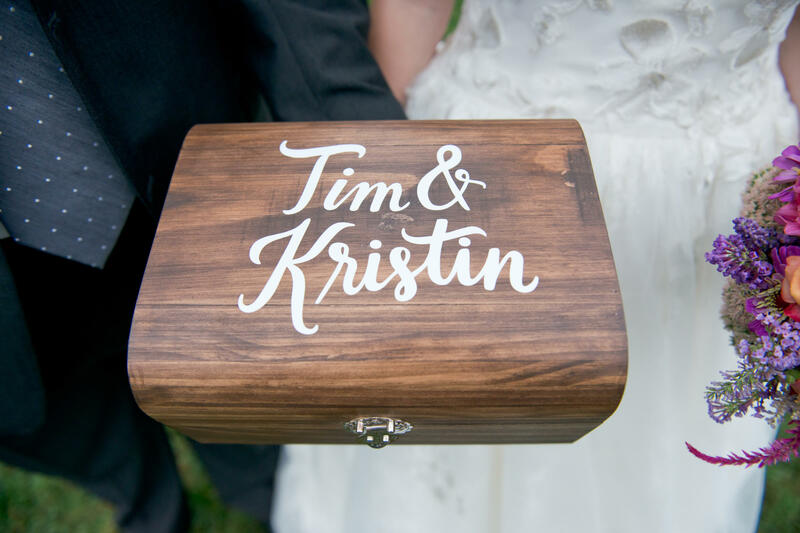 After hunting on Etsy, they finally found a box at a local craft store. They went through all their mementos from their time together and picked out the really important ones to place in the box (along with their vows): a favorite picture of them in 2012, a swatch of her prom dress she gave him to match his vest, a note she had written to him early in their courtship, and their tickets to the after-graduation harbor cruise, during which Tim told Kristin he liked her for the very first time.